Createspace Independent Publishing Platform, 9781508597421, 326pp. Her simple life just got a whole lot bigger. Deidre McIntosh is a woman with it all...a successful business, a doting fianc , a baby on the way. But business is getting busier, Kevin is always on the road and Deidre's future mother-in-law has hijacked the wedding plans. To make matters worse, Kevin's sullen goddaughter, Claire, has been expelled from boarding school and has ended up in Deidre's care, a temporary arrangement that seems more permanent by the day. Claire Phillips doesn't want to be in Seattle. It's bad enough that her own parents are too busy with their lives to care about hers, but being stuck with Deidre is like a prison sentence. Deidre works, cooks, cleans and crafts...the woman is obviously nuts. Claire knows it's just a matter of time before she's enrolled in another boarding school, out of sight and mind once again. But when a woman appears on Deidre's doorstep, both Deidre and Claire find themselves faced with the ultimate question: what is family, and what lengths would you go to care for those you love? 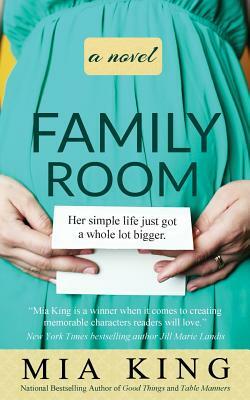 Mia King is the national bestselling author of Good Things, Sweet Life and Table Manners. Her books are selections of the Doubleday, Literary Guild, Rhaspsody and Book of the Month Club book clubs. She is at work on her next novel.